I got pulled over for a DUI. What happens next? I was involved in a car accident, how long should I receive medical treatment for? If you were injured in a car accident, it is very important that you seek medical treatment right away and continue medical treatment as necessary. Generally speaking, you should receive medical treatment until all of your injuries diagnosed and you feel that you have reached maximum medical improvement. 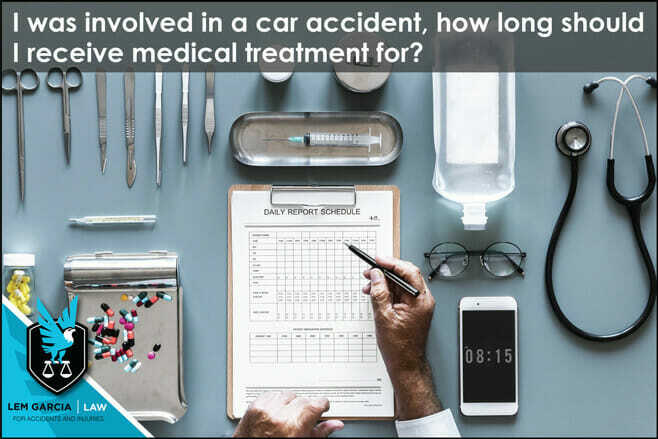 It is hard to say how long you will need medical treatment for because all car accidents are different and everybody responds to car accidents differently. Some people are absolutely fine after a car accident and don’t need to receive any medical treatment whatsoever and some people feel pain for months or even years after a car accident. Some people even need medical treatment for years after a car accident even though the property damage to their vehicle is minimal. There is no telling how much an individual has been hurt based on the property damage involved. Yes, it is true that insurance adjusters do value your claim based on how much property damage your vehicle suffered, but that is an unfair assessment of the significance of your injury. The fact that the damage to your car is minimal should not preclude you from getting the medical attention that you need. As a general rule, if you are not feeling well, you should continue medical treatment until you feel better or your doctors have told you there is nothing else medical professionals can do for you. West Covina car accident attorney, Lem Garcia, helps people who have been injured in car collision recover as much as possible from the person who is at fault. If you were recently involved in car crash, it is important that you speak to an experienced personal injury lawyer right away to find out what you can do to make sure that you are taken care of. At Lem Garcia Law, case consultations are always free and without any obligation.